This SIGNAL blinking cellphone holder is the perfect device for that super-silent office with the most uptight employees. 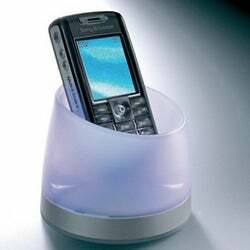 Place the cellphone in the cup, turn it to silent mode and the cup will flash lights when a call is coming in. It is ironic because the ringing will no longer piss off the cubicle neighbors, but I'm sure answering the phone and talking about how completely obliterated you got the night before is perfectly okay with Sally in accounting. $21.